It may be said that the bigger and more epic the scope of a story, greater is the chance of it devolving into conventional tropes. 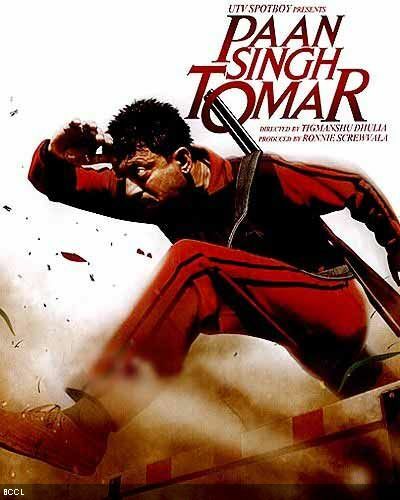 Such is the case with Tigmanshu Dhulia's Paan Singh Tomar (PST). His previous venture Sahib, Biwi aur Gangster took 3 characters and spun a tight drama around them with wit and invention, but this biopic of an international class athlete forced by circumstance to become a dacoit (or from his point of view, a “rebel”) sadly feels all too familiar. The primary mistake Dhulia makes in his approach to presenting the story is to take the linear “let's begin at the beginning and take one thing at a time” route. So one chunk of the film is devoted to Tomar's stint in the army and his discovery as a star athlete, another to the circumstances of the destruction of his family and subsequent revenge, and a third to his exploits as a dacoit in the Chambal ravines. Apart from a few instances, there is little resonance between these segments that refreshes the uniqueness of the character in the audience's mind. So while part one unfolds like a Reader's Digest inspirational story, the bulk of the film is yet another dacoit drama. Irrfan Khan's lead role performance is a mixed bag. Sure, he's the right man for the job and has “run the full mile” for the athlete segment, but in the rest of the film he only occasionally transcends the “Nana Patekar for the mumblecore generation” stereotype that has defined most of his acting resume. An undeservedly generous 2 ½ hour running time only adds to the tedium of the proceedings. There are things to admire about the film: A lot of hard work has gone into establishing the credibility of the characters, and costumes locations and dialects have been meticulously researched (Dhulia was casting director on Shekhar Kapur's Bandit Queen). But that's part of the problem; lacking the perspective and raw intensity of its predecessor, PST never really gets away from being a less accomplished clone. Technically again, it's a toss-up. The visuals are decent but rarely striking (a nocturnal siege towards the end is captured nicely). Rakesh Ranjan provides a nicely textured soundscape but his efforts are often stymied by the obnoxiously loud and generic background score (Sandeep Chowta). In fact I suspect that the background score was inserted for this re-release (PST apparently had a short window release in 2010, primarily at film festivals) because it seems so at odds with the rest of the sound. So while it's not bad by any means, PST feels all too been-there-done-that, which is a shame considering the potential of the story. It's still a change from most of the stuff currently playing on Indian screens. P.S. When the film closes, it gives a list of some other Indian athletes that later became victims of circumstance. This is immediately followed by the stupid health ministry mandated warning that "Cigarette Smoking is Injurious To Health", appearing to suggest that those athletes landed in dire straits owing to their smoking habits. Nice movie.. But why do people start cursing other heroes/heroines whenever a good movie comes out of the blue??!! Simple thing Irrfan wont suit for the role of SRK in DDLJ and SRK in Paan Singh Tomar ! !